We asked one of our favourite bloggers, Ricky aka Skint Dad, to tell us what drove him to swap takeaways for ‘fakeaways’. There’s no turning back now for this thrifty father of three – let’s see how he got on! These words, or variations of these words, are heard in households up and down the country throughout the year…and it’s costing us a fortune. You may need to sit down for this – the Office of National Statistics reported that as a nation we spend in excess of a shocking £112 million pounds per week on takeaway meals eaten at home. £112 million! Putting that into context, they also reported that in 2012 we spent £110 million a week on fresh vegetables. Take the above meal for instance. My local Chinese takeaway charges £20.80; head into one of the larger cities like London, Manchester or Liverpool and the same takeaway would cost you almost £30. Do this four times a month, or even just twice, and you can start to see the costs add up. Back in September last year, we were really starting to struggle financially. On closer inspection we were heading towards a situation where, if we didn’t do something, the consequences could have been severe. We had to start cutting back, and that’s exactly what we did. After going through the transactions on our bank statements one by one, we were shocked (albeit not overly surprised) to see that we were spending an average of £60 per month on takeaways! There really wasn’t any excuse. Yes, we’re a busy family and yes, it’s nice to have the occasional treat and yes, the grilled dumplings from our local Chinese takeaway are like velvet in my mouth, but it’s still not an excuse. There was no way I was going to make this situation worse just because I fancied a takeout once a week. No, that £60 could be used elsewhere. We could put that money towards paying off a debt, or covering a month’s train travel to work or a week’s food shopping. Just thinking of it in those terms, you start to realise the true value of what you’re spending and where. So that was it, our occasional treat was no more. The problem was, I didn’t want it to be no more. I liked having a takeout a few times a month. Just because I have debt doesn’t mean that I’m happy to put my entire life on hold until it’s all paid back. That’s when I got my bright idea…the fakeaway. I started looking at the dishes we ordered which cost us so much money, and wondered if we could recreate them ourselves. After looking online at different recipes and the ingredients involved, I was pretty convinced that we could…quite easily! After setting ourselves a few rules including cooking completely from scratch, recreating the dishes we would normally order in and setting ourselves a maximum budget of £5, we dived in with our first fakeaway. 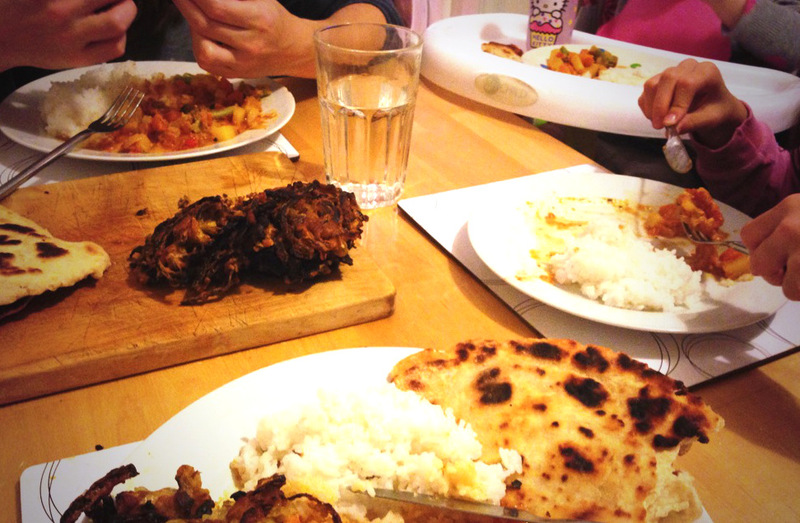 We went for vegetable masala curry with rice, naan bread and onion bhajis – click on the link and read the recipe on my blog. Truth be known, we’d never cooked these dishes from scratch before and I’d be the first to admit that I’m no Jamie Oliver. Sitting down to dinner with our first fakeaway felt like such an achievement. We’d actually done it. We had created a family meal for four people from scratch that we would have normally paid a small fortune for, for the almighty cost of £2.57. It was more than that though. We were struggling with money and were cutting back everywhere we could. Morale in the household was at an all time low and even the wider family were commenting on our sombre moods. This one fakeaway brought our family closer; we worked together, doing something for each other and at the same time knowing that we could pick ourselves up and clear our debt. Granted, our fakeaway took a little more time than picking up the phone and there was a lot more washing up than normal – but you know what, we kicked ourselves for not doing it sooner. The food was tasty, the cost was low, we’d learnt to cook new dishes and we enjoyed ourselves in the process. After creating different fakeaways over the last few months, and saving an absolute fortune in the process, there can be no argument that when you have the choice of spending hard-earned cash on takeout food or creating the same dishes from scratch, the latter will win every time. It may sometimes take longer to prepare, and you may smash the odd plate here or there, but ultimately if you are serious about cutting back but don’t want to go without the odd luxury, then the fakeaway should be on the menu every Saturday night.